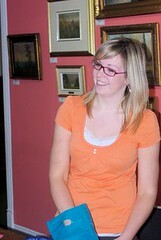 Huronia Museum was fortunate to have Sarah MacAuley complete her co-op placement with us this semester. The staff tried to give Sarah an opportunity to see just how busy and dynamic the museum having Sarah split up her time in three different departments. Sarah spent two days a week working with the Collections Manager, Nicole Henderson. Naturally Sarah got to assist with processing artifacts, scanning photos and work on a transcription of some historical documents. Sarah also got to participate in Exhibit Development Training with Bev Easton of Easton Designs. Sarah provided our Education Coordinator, Gillian Ross, with support two days each week. This included preparing education kits and making sure that all students got the most out of their visit with us. Sarah also provided administrative support and helped to prepare newsletters and for special events. Sarah is off to France for the summer and we all wish her the best. It is great to see staff get recognition on the blog. I hope this becomes a regular part of the blog information trail. The Huronia Museum has dedicated, hard working staff.